This year I chose not to keep track of my expenses in Quicken like I did in prior years. Instead I have used the last couple of cloudy drizzly days here at home in New England to tally my Prius Travel Costs in .exl and use it to create my graphs. My first year in my Class B Campervan was too expensive to travel the country and I spent more money that I could sustain on my yearly travel budget. At close to $10K in expenses the first year I chocked it up the high costs to a learning curve. I knew that as soon as I came home I would sell the Class B and get a Prius. Each year I have reduced my expenses with last year being under my goal of spending $1000.00 per month. I have done a better this year but its hard to equate year to year due to differences in spending. I spent 1 week with CA son and family vs 2 in the past. I spend 1 week with MD son as I have in the past. I needed to fly home for the funeral for my mother in-law. These expenses of flying home and spending the long weekend with my son are not included in my total expense costs this year. Every traveler should have an emergency fund to cover for such situations when they happening. These were not part of my Prius Travels, although I did include the $53.00 to part at the Las Vegas Airport. I fueled 53 times for a total cost of $723.43 covering 14,723 miles through 25 states. 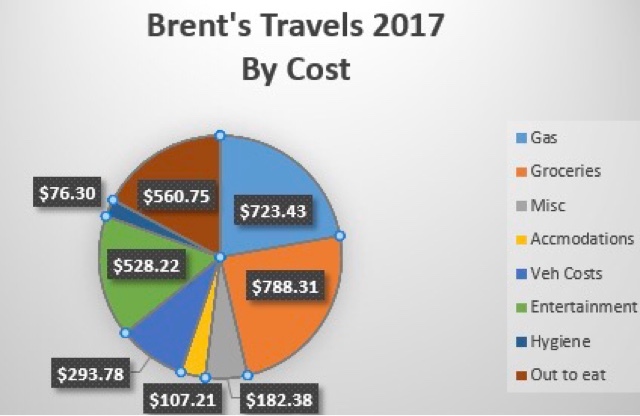 I traveled about 20K miles last year for $850 or so. 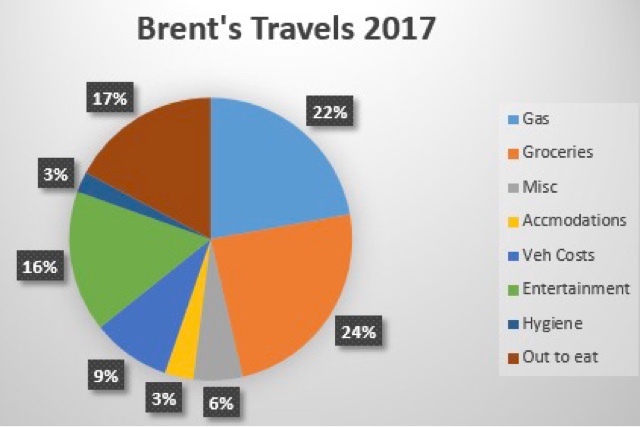 I traveled less mileage this year as my CA son moved from Monterey to San Diego. My calculated MPG is 46.2. While I got better mileage in my first year this year, as I didn't run climate control, this year is nearly the same as last year. I chose to run climate control and stay warm going to and getting up from bed, when it was cold outside. Also a few times I ran air conditioning when it was hot and/or muggy in the car. I also used my Prius in ready mode to charge my house battery when solar was not practical. You loose about 4-5 mpg over the whole trip average doing this. What did the charging of my house battery and enjoying the climate control you ask? Well, I calculated it as 24 gallons. At $2.35 pre gallon it cost me about $56.00. It was worth it to me but if you want to save money there is money there to save. I was gone 117 days and I deducted the days I was not staying in my Prius so I figure I was in the Prius for 89 nights. Therefore the cost to run my Prius this way calculates to $0.63/day. I like to cook, so I usually go to the store and buy what I need. I keep at least 6 days of food with me but fresh meat or fish I cook within a couple days and then use the cooked product over a few more days in different dishes. Vegetables will last for 5 days at least, and salad material lasts longer as I repackage in Ziploc bags and squeeze out all the air and save space and get more longevity with what I buy. Groceries was the largest expense but I caution that groceries include food items as well as other things I needed from the store while I was there. For example when in Walmart and needed butane fuel for my stove it went in the basket and I did not separate out the cost, so my $788.31 in grocery expenses is inclusive of many various small things that I bought when buying food supplies. It is way too much work to try to separate out this detail. My daily expense for the 89 nights in the Prius is $8.85 and this includes buying entre items that are packaged in a way that it is more than I can use so when I was with others I would often offer to cook the entre and they would cook the sides and we shared both. My grocery expenses also included buying things I shared with the group such as the salad supplies and the dressings for Easter Dinner at the GTG. I spent a lot more than I would have for myself but as you can see traveling over 89 days it doesn't show much. I don't care for the category name but I did spend money on some things that don't fit elsewhere. My biggest single expense was parking at the Las Vegas Airport when I flew to Seattle to meet MD son for the weekend at $53.00. The next expenses were US postage to send things home that I bought for people or to declutter my vehicle of items I no longer wished to carry. My total Miscellaneous costs were $182.38. You should plan for things in this category and although you may not have a $53 expense to park your car at the airport you will have other expenses such as tolls that you pay cash for. In full disclosure, I did pay tolls for my trip home through IL and from MD to MA that got charged to my EZ pass account that do not show up in my expenses. I am guessing this was another $100 in tolls not accounted here. Tolls add up very fast on the east coast via I95 and similar routes..
My biggest single accommodation expense was the Casino in Laughlin, NV at $16.21. Heck, a shower at a truck stop is $12, so the mid-week deals at the Casinos in Laughlin are a good bargain, provided there is nothing going on in town. The next biggest expense for overnight stays was at Lone Rock National Campground in UT just over the boarder from Page, AZ. It costs $14 a night for pit toilets and rubbish, but you get a great view of Lone Rock and Lake Powell. With my Senior Pass I pay half price. I stayed there 3 different times. One was my first attempt to win the lottery for The Wave, when I won The Wave, and coming and going to Escalante, UT. Overall for 89 days I spent $1.21 a night. Not bad at all. I run synthetic oil in my Prius and I change it at 5,000 mile intervals. I may go over a little, and I could wait until 10,000 but since I run the Prius in Ready Mode often for charging, heat, or A/C I stick to the 5,000 mile oil change and tire rotation. Of course my Prius gets looks from the service staff as I bring it in for routine service and I have to tell them please do not check the Prius battery and cabin filter as there is too much going on in my car to mess with. I take my Prius to dealers for service as all Toyota service centers are electronically tied and I have an extended warrantee that requires that I maintain service to the conditions in the Prius service manual and I then don't need to keep records. I did have some lights burn out that I fixed myself at Autozone, but these costs are small. My main costs are primarily 3 Toyota Dealer services for a total of $293.78. I didn't have to buy any tires while on the road this year like the last two years, but will need to replace the tires before future major travels. I plan for $100.00 for every 5K miles for service and miscellaneous items I may buy, but the Prius is so reliable that I mostly have to worry about tires as I have had flats in the past. I expect to have to buy 1 or 2 tires when I travel each year at $140 each. My entertainment expenses went through the roof this year. I usually go to the movies a few times during my travels, which I did. I also may visit a fair or festival and museums, but I didn't have these costs this year. 1. Joanne and I shared the cost of the Havasupi Reservation expenses for our hike in and stay at Havasu Falls. It was $240, so I paid $120 for the 3 days. 2. I have been to Horseshoe Bend on the Colorado River just south of Page, AZ a number of times and seen the rafts on the river. I decided I wanted to take this flat water trip from below the Lake Powell Dam to just before the white water starts on the Colorado River around Horseshoe Bend. It cost $115 for the day trip. 3. My biggest expense was $220 for the rental of the 4x4 Jeep to get to The Wave Trailhead. This was an executive decision to get a 4x4 vehicle. It was raining when I got the permit to go. The rain was going to stop overnight. The ranger said to be safe we recommend having a 4x4 due to the slick clay spots on the road. Although I had been on the road a couple weeks before with my Prius and I was successful getting there, the road had just been graded and it hadn't rained. So, when I got out of the BLM office with my lottery permit in hand I called Page to rent a 4x4 to get to the trailhead. As it turned out the road was bad with ruts, but wasn't slippery as it had time to dry. I called my purchase insurance as I would have been very upset to have won the lottery to go and not be able to get to the trailhead. I wash each day in my Prius as I have written about in the past. I wash my hair daily or at least every other day in my Prius and use the soapy water for washing the rest of me. I use about a quart of water a day to do this. Washing everyday therefore doesn't require taking showers everyday too, so I got down to buying 6 showers over the course of my trip. One important one was when I came out of the 3 day hike to Havasu Falls. Others were random decisions usually based on how I felt. Truck stop showers are great and a good value to me at $12, but the costs adds up as it did for me last year. This is an expense line item that can grow quickly and become a major expense if you can't become accustomed to washing in your vehicle. Most camping locations that I stay at do not have showers and therefore why they don't cost anything or very little. If you need a shower a day to make this travel work for you, that would be 89 nights at $12 is a whopping $1068. My out to eat expenses range from going in and getting an unsweetened ice tea to snack bar, to full meals. In this category is anything you buy to eat immediately. My expense of $560 comprises of mostly me eating by myself but there are some expenses here that I paid for others too to eat with me. I mostly reserve the eating out when I travel long days and park at 8 pm and don't want to cook I could cut back on this number to some degree to save some money. My McDonalds reload card is an expense that is applied here. My total expenses for my travels this year was $3260.38. This is $36.63 per day cost. Which is and expense of $836 per month as I was gone 4 months. I don't keep track of the day to day expenses this year as I have a handle on my spending and that I can stay under $1K per month. if I removed the high cost of entertainment I spend this year the number gets better. I don't want to do this as it is my desire to enjoy my travels and the fact that I save so much on fuel, I can afford to enjoy myself from time to time. For example if I still had my Class B that got 10 mpg my costs would have been 14723 miles / 10 mpg = 1472.3 gallons of gas used x $2.35 per gallon = $3,460 in fuel costs. Since my Prius only costs $788 compared to my Class B of $3460 I figured I saved $2672 in fuel costs. This is a great return on investment. I have traveled for 3 years with my Prius $2672 x 3 years = $8016 in savings using the Prius over the Class B. The Prius cost me $16K to purchase used with 8,000 miles on it. In 3 years of Prius travels I have saved half of the price I paid for the Prius. So, if you are comparing my costs for travels you must calculate the miles you plan on traveling, your MPG, and the going rate for gas/diesel and insert your number here. If I use the Prius for 6 years of travel at these savings I will have saved the total purchase price of my Prius over operating the Class B. As usual, if you have questions or comments please click below. I don't have your type Prius but you could make a small fortune building those little tables you have for your rear door. I would build it just like you did only molded abs plastic. Thanks for the compliment. You are correct that abs plastic would be an excellent choice for materials. I enjoy designing solutions to problems and there were many aspects of the table that fits between the door frame that worked out well. I would be happy if I inspired others to think of and design simple solutions for their travels.